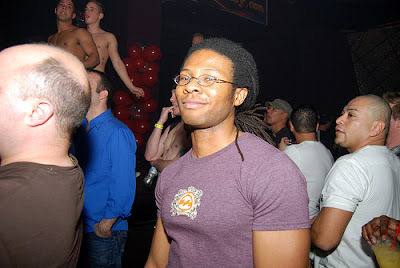 As further proof of how crazy I am, I recently went to Las Vegas to provide media coverage of the Hustlaball for PinkMafiaRadio.com. The Hustlaball is an annual party with a whole lot of pornstars, strippers, and rentboys letting loose. It was a really awesome event with lots of eye candy and mini-performances from pornstars like Jake Deckard. They even had this crazy instant photobooth that looked like a bathroom stall that we all took crazy photos in.